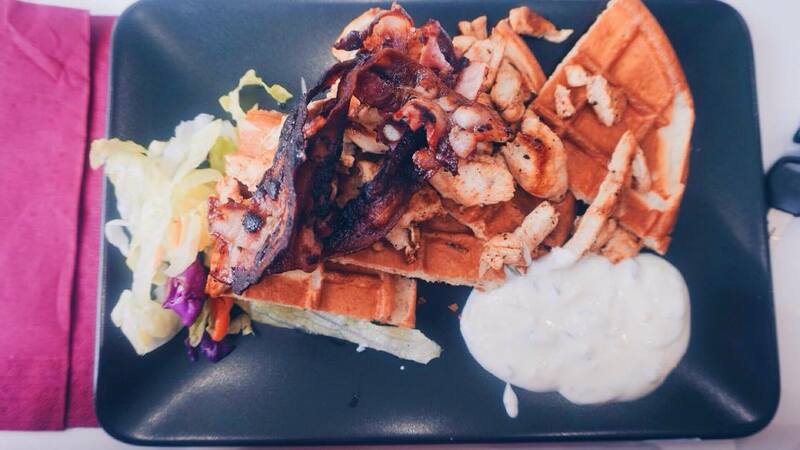 Waffle Bros is a pretty new little waffle place that has just surfaced in Malta not to long ago. I had been meaning to pop in and try out their desserts but soon released they had much more to offer. It was a Sunday Morning and we had decided we wanted to skip breakfast and go ahead with dessert before Lunch. I had been meaning to try Waffle Bro, the Waffle Bar for a while now but it seems to closed in the evenings so after work was never the option. Since it was Sunday, We tried our luck not knowing if it would be too busy to sit down and have a bite to eat. We arrived around 11.30am and we were told to wait by the bar as they had a quite turnover and we were seated in just 10 minutes. Whilst looking at the menu, I was very curious about their savory waffles, They had breakfast waffles with sausages, eggs the lot and many more to choose from. 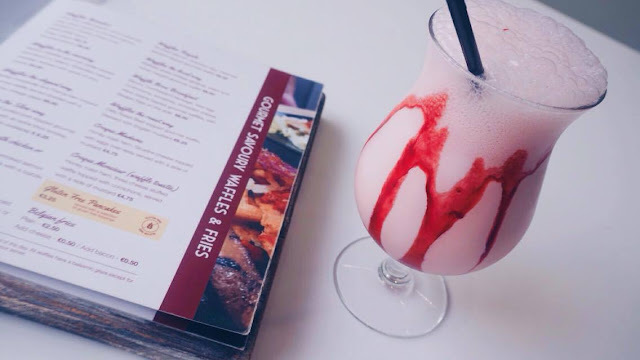 I opted for the Strawberry Milkshake (€3.80) to start with which was presented in a cute cocktail glass with strawberry sauce drizzle, Ryan ordered Bulmers Cider (€2) and ordered our mains. Ryan ordered the Waffles Benedict which is the gourmet waffle topped with a poached egg, crispy acon drizzled in a freshly made Chine Holladaise sauce - the sauce was actually put in a little sauce cup on the side as Ryan requested. (€5.75) We also tried their Belgian Fries (€2.50) which were delicious and served with salad. 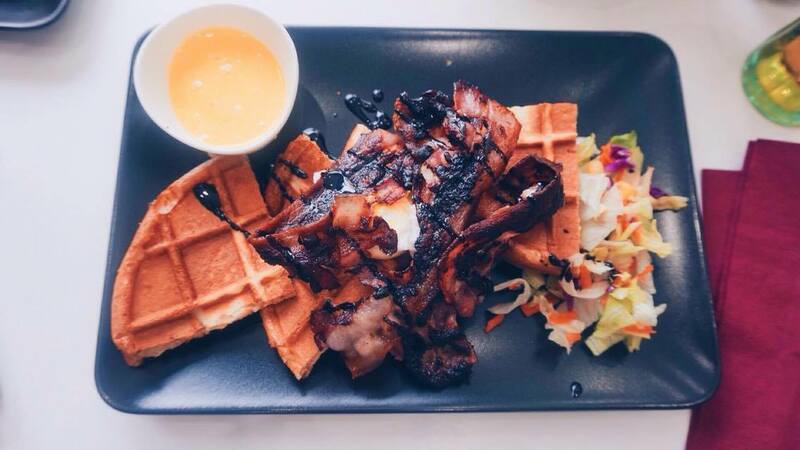 The Food was outstanding and I was pretty much blown away, the sauce was amazing, the waffles and chicken was to the T-amazing. 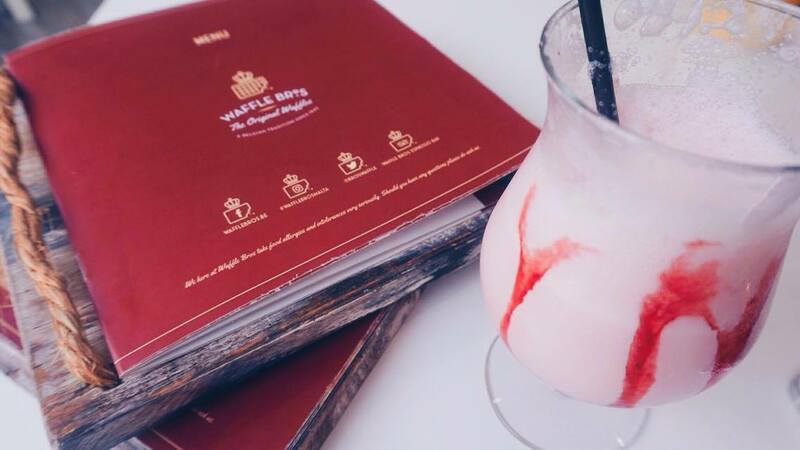 The best thing is it does fill you up just like a proper meal, great place for having your lunch 100%! Just writing this makes me want to have a plate of this again. We Can't go without Dessert. 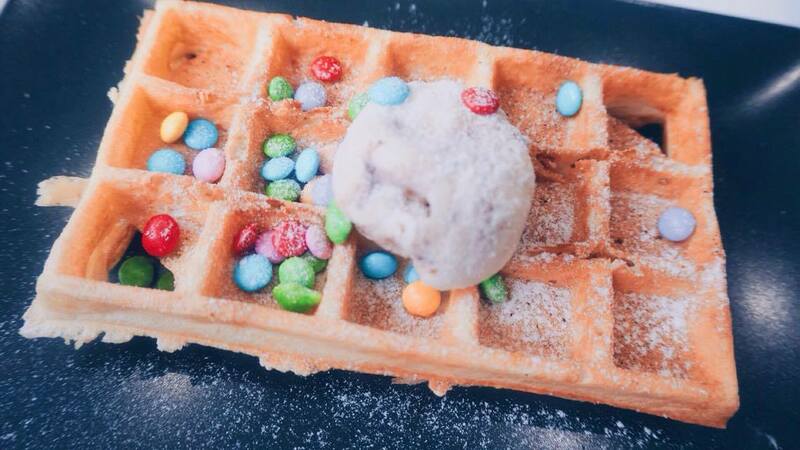 to be honest I wasn't that hungry and didn't want a big waffle to I kept it simple wit a Brussels Waffle with a scoop of Snickers ice cream and smarties (€5.25). Next Time I would definitely go big with Nutella and sprinkles the lot, but to be honest the Savory Waffle was so Delicious that we ate it all not leaving room for more! Overall, I'd give the Restaurant/Cafe a 9/10 - The staff were always so polite, the Food was amazing and the price wasn't expensive at all. Our Bill came to a total of €36.85 which in my opinion probably the cheapest place we've ever eaten from and left with a full stomach! I would definitely recommend you check out their little place, The ambiance is so welcoming and will definitely be a regular there.